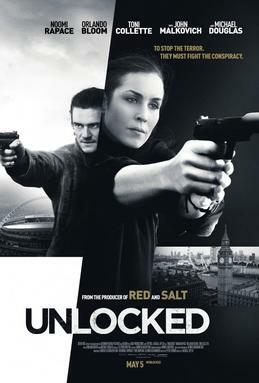 Since September 1st the action thriller »Unlocked« is out in US cinemas, co-starring Michael Epp belongside Orlando Bloom, Michael Douglas, Noomi Rapace and John Malkovich. In the feature film, directed by Michael Apted, a CIA interrogator is lured into a ruse that puts London at risk of a biological attack. Michael Epp was born and raised in the south of Germany where his parents run an antique shop. Thanks to his mother he was raised bilingual and at the age of 17 he moved to Hudson, New York and later the City itself to study acting at the HB Studio with Austin Pendleton. Today, Michael is based in Berlin and London. In 2015, actor Brady Corbet cast him in his debut film “Childhoof of a Leader” along with Robert Pattinson and Liam Cunningham. The Film won awards for “Best Director” and “Best Film” at the Venice Film Festival and opened in the US and UK in July 2016. Next, Michael played his first lead part in the Sony Picture Beyond “Valkyrie”, a WW2 film directed by Claudio Faeh which also stars Rutger Hauer and Sean Patrick Flannery. His upcoming projects include the Lionsgate feature “Unlocked”, directed by Michael Apted, with Orlando Bloom, John Malkovich, Michael Douglas and Noomie Rapace. Other previous and upcoming projects include the miniseries “War and Peace”, “SSGB”, “Collide” and the Italian/French production “le confessioni”. Michael has also been working in Germany and his credits include the ARD miniseries “Weissensee”, “SOKO Stuttgart”, “Wir sind die Flut” and “Wann endlich küsst du mich”.